The short rest in the lobby will fill you with anticipation for the hospitality of the ryokan that is about to commence. 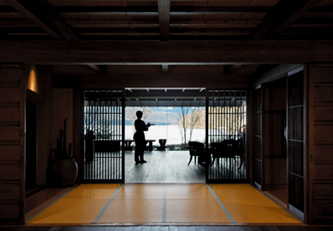 All members of the ryokan staff will, without fail, extend words of greeting or make a bow upon encountering guests. A bow (the Japanese word being eshaku) is made by slightly lowering one's head with a smile, but the original meaning of eshaku is to show consideration for the other person and to respond with courtesy.The ryokan staff are always concerned about the needs of their guests and try to meet their needs. It is this spirit that is the essence of hospitality at ryokans. Seated in the peaceful lobby, you can hear sounds from ingenious contrivances featuring water, or background music such as koto melodies, which create a soothing atmosphere.